No matter the time of year, there is a need for comfort food. Winter cries out for hot soups and hearty stews. Fresh produce that had been lost during the cold months is celebrated in the spring. Summer's bounty calls for salads, fresh fruit and bbq. Fall reminds us we are mortal as we say goodbye to fresh produce in a last celebration of corn, figs and leafy greens. 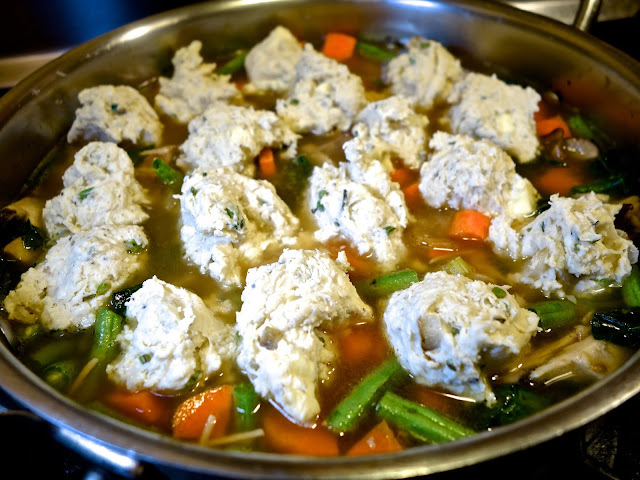 Through all the seasons, I enjoy chicken and dumplings because its rich broth is nourishing. 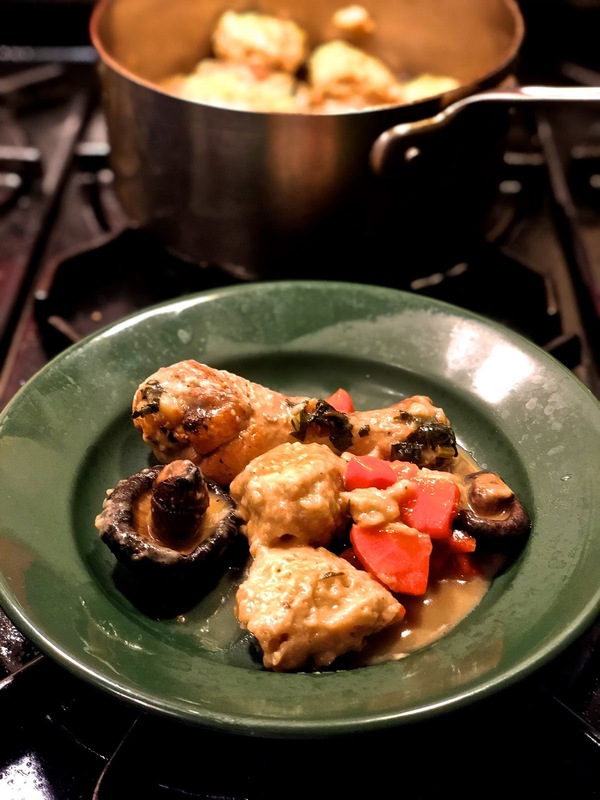 Adding a heap of farm-to-table vegetables brightens and the sweet succulence of braised chicken and wholesome dumplings adds depth and umami to the dish. What is more, this hearty, flavorful dish is inexpensive and easy-to-make. The basics are straightforward. Fresh chicken. A handful of favorite vegetables. A cup of white flour. A bit of half and half. A cube of butter. Homemade chicken stock. A few seasonings. Simmer. Cover. Uncover and serve! Easy-peasy. Use a good quality organic chicken and buy farmers market produce when available. If you have dried whole shiitake mushrooms, use them. They add a distinctive flavor, different from the delicate flavor of thinly sliced shiitakes. Use vegetables you love. And lots of them. English peas. Squash rounds. Kabocha chunks. Roasted sweet potatoes. Green beans. Kale. Shredded cabbage. Chopped turnips. 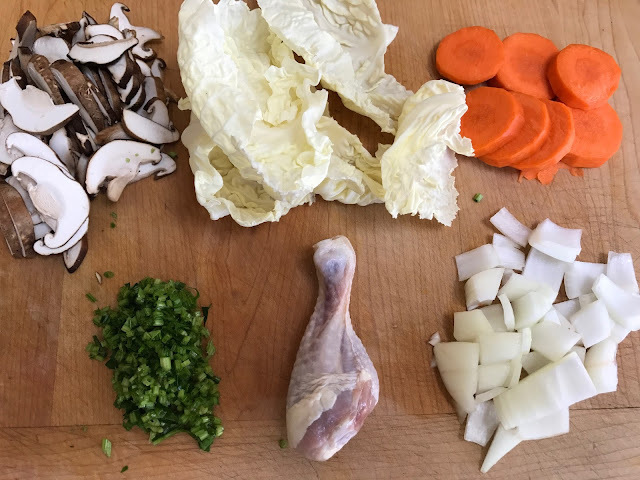 My preference is to tilt the balance towards the fresh produce, plating great mounds of vegetables with a leg and a wing or two pieces of breast. The dish can be covered and served the next day or divided into smaller covered containers and frozen for up to three months. Break down the whole chicken by cutting off the legs, thighs, wings and breasts. Place the carcass into a large pot, cover with water and simmer covered for 45 minutes. Strain through a colander, reserving liquid in a bowl. Let the carcass cool and remove the meat. 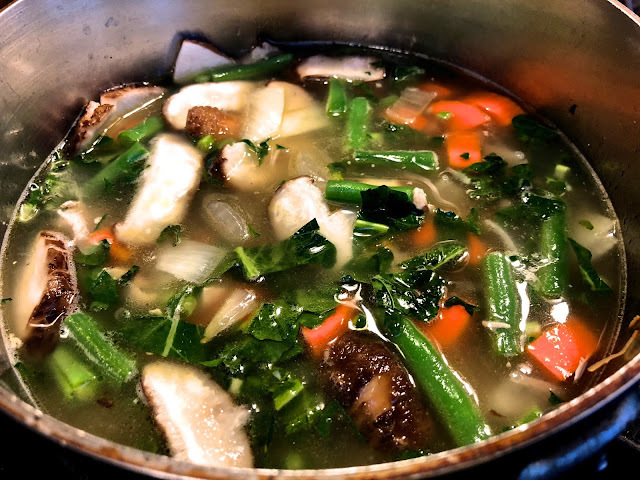 Use what stock is needed for the dish, reserving the rest covered in the refrigerator for up to three days or in the freezer for up to six months. The meat pulled off the carcass can be added to the braise or submerged in stock and frozen for later use. Separate legs from thighs. Separate the three parts of the wings, adding the wing tips to the stock pot. Cut chicken breasts into three almost equal sized pieces. If removing skin from the parts, add to the stock. In a mixing bowl, add flour, cut up butter, scallion (or Italian parsley), baking soda, sea salt and black pepper. Using a fork, mix well. Slowly add milk, stirring until thickened. The resulting mixture should be like thick batter. If the mixture is too runny, add a tablespoon of flour. Cover and set aside. For the braise, in a large pot, heat olive oil and sauté the chicken parts. Use tongs to turn the parts until each piece is browned on all sides. Remove and set aside. Sauté the onions and garlic (optional) in the pot with the chicken fat and oil until softened. Season with sea salt and freshly ground black pepper. Add chicken stock. Return browned chicken pieces to the pot. Stir and simmer 20 minutes. 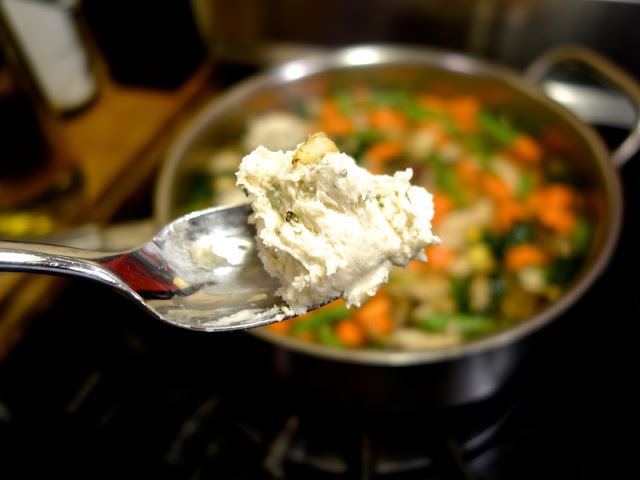 To make the dumplings, use two soup spoons to create small rounds of dough. Drop each dumpling into the simmering liquid. Make room for each dumpling so they do not touch because they will expand as they cook. Add all the dumplings and cover. Adjust the heat so the stock simmers but does not boil. Cook 30 minutes and serve immediately. Place several dumplings into each bowl, adding a protein and a good helping of vegetables with several tablespoons of gravy. I love meat. A big steak. Fried chicken. A rack of ribs. But I also love veggies. Carrots. Onions. Cabbage. Mushrooms. English peas. Spinach. Broccoli. Asparagus. When I want to prepare an easy-to-make meal, I turn to vegetables to help me out. Full of flavor, vegetables cook quickly and get a meal on the table without too much effort. For today I'm going light on the meat and heavy on the vegetables and aromatics. The portion for each person (pictured below) uses only one chicken leg or thigh and one pork sausage. That small amount of animal protein will add a large amount of flavor that will grab on to the vegetable flavors and bundle them into umami deliciousness. Sautéing the vegetables, chicken and sausage in seasoned olive oil adds flavor by caramelizing the outside. That lovely browning also removes some of the water, concentrating flavors. The dish cries out for a starch. Since the recipe will create a sauce, serve the ragout with dumplings, steamed rice (brown or white), pasta or large croutons. Use any vegetables you love. In many dishes, cutting vegetables into a small dice adds to the flavor but that makes the vegetables disappear. To create a hearty dish, cut the veggies into large pieces. Pork sausage is best because the fats add more flavor than other sausages. For those who want to avoid pork, the sausage is certainly optional. Skin on the chicken adds flavor. The dish can be prepared ahead, even the day before and reheated. Use cabbage, broccoli, asparagus, English peas, spinach, celery, corn kernels, quartered Brussel sprouts, green beans, slow roasted tomatoes finely chopped or any other vegetables you enjoy. The vegetables should have a crisp quality, so avoid over cooking. Leafy vegetables will cook more quickly, so delay adding them until the end or, if reheating, add those just before serving. Only use green cabbage. Red cabbage will discolor the broth. Savoy cabbage has more delicate leaves and more flavor than does green cabbage. If using large cabbage leaves, separate the delicate part of the leaves from the thick rib. Finely chop the rib into small bits. The delicate leaves and the finely chopped ribs will be cooked at different times. Heat olive oil in large pot. Season with a dusting of sea salt, black pepper and cayenne (optional). Add chicken legs or thighs. Remove when lightly browned on both sides. Add sausage rounds. Brown as with the chicken and remove. Sauté onions, finely chopped spinach stems, finely chopped cabbage ribs and mushrooms until softened. Add browned chicken parts. Cover with water. Cover pot and simmer 30 minutes or until chicken is tender. Check every ten minutes and add water if needed to keep covered. 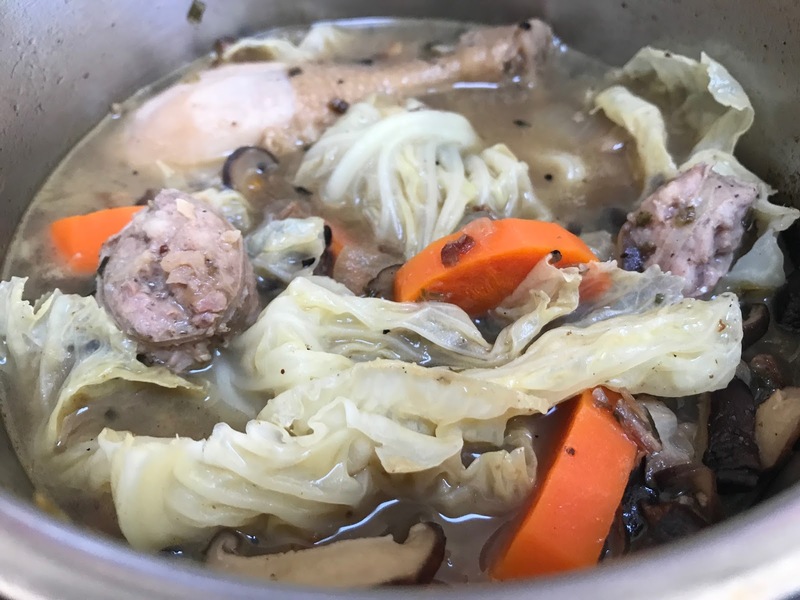 Add browned sausage rounds, spinach leaves, cabbage leaves, carrot rounds, garlic (optional) and any other similar vegetables, like Italian parsley, broccoli or celery. Add water to cover if needed. Cover pot and simmer 10 minutes. Add English peas if using in the last 2 minutes. Taste and adjust seasoning if needed. If broth needs more concentrating, return the pot to high heat and reduce liquid until flavorful. Serve hot with dumplings, steamed rice (brown or white), pasta or large croutons. The holy grail of home cooked meals is a dish that takes practically no time to make, the ingredients are inexpensive and the results are delicious. I found a pasta dish that fits all of those criteria. The ingredients are basic. 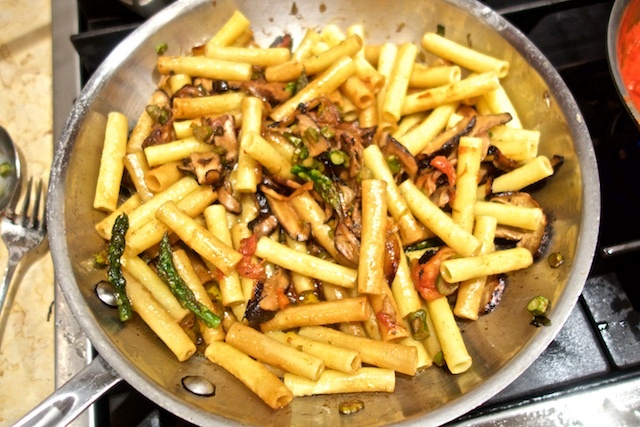 Olive oil, tomatoes, onions, mushrooms and a green vegetable like asparagus. The seasoning is straight forward, just a little sea salt, black pepper and, if you like, a pat of sweet butter. By the time the pasta is al dente, the sauce is finished. Anchovy filets are the special ingredient that creates an extraordinarily delicious pasta. If you have enjoyed spaghetti alla puttanesca in an Italian restaurant, my recipe is similar but with more delicate flavors. 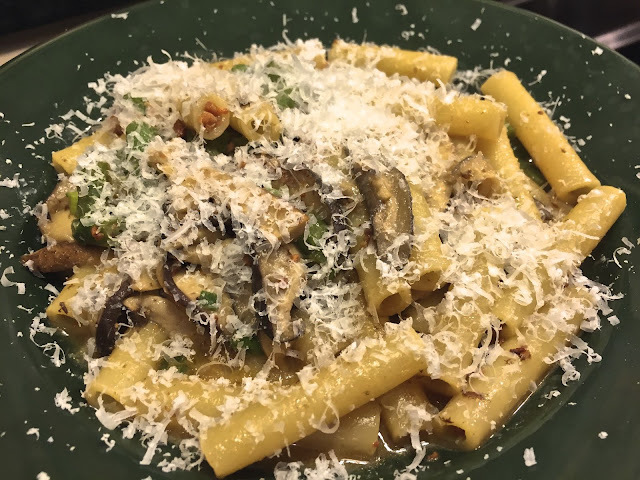 Even people who don't like anchovies by themselves fall in love with this sauce because the anchovies dissolve, binding together all the flavors. The result is an earthy, deeply satisfying dish. Anchovies are a ubiquitous ingredient in Mediterranean cuisines. 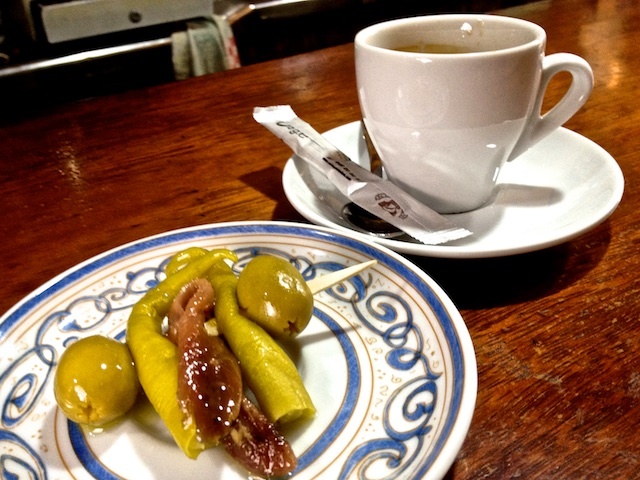 Stop in a neighborhood cafe in Northern Spain, as I did in the cathedral town of Burgos, and you will certainly have a tapas with an anchovy filet skewered along with a pepper, pickle and an olive or two. Those delicious filets are front and center on the dish, displayed in all their fish-filet-glory. With an espresso or an ice cold glass of beer, nothing is better for an afternoon snack. Use high quality Spanish or Italian anchovies preserved in oil. Do not use salt preserved anchovies, ones wrapped around capers or filets with skin. Anchovies are sold in 2-4 ounce tins or glass jars. 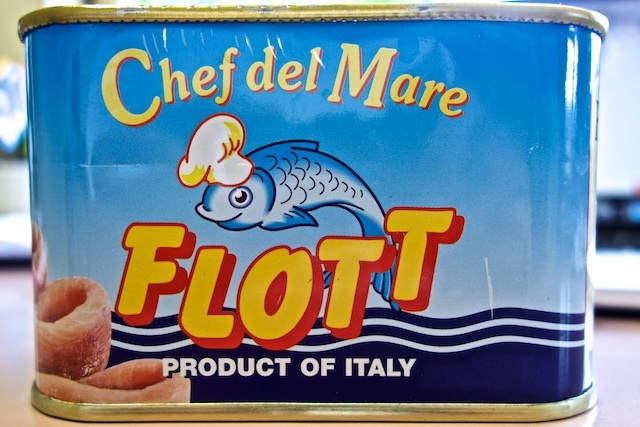 I buy anchovies in larger quantities like Flott's 28 ounce tin. That way I always have them in the refrigerator to add to deviled eggs or tapenade. Kept in an airtight container and submerged in oil, the anchovies will keep for months. 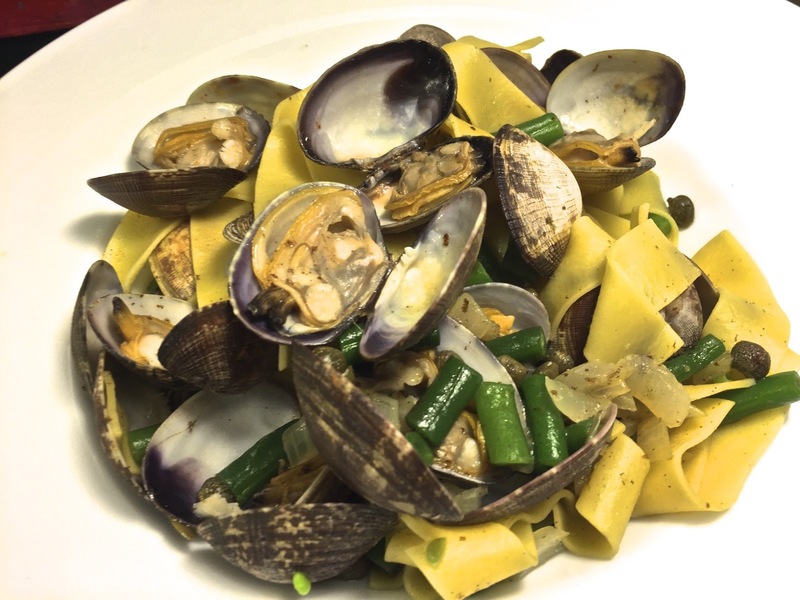 Use a quality pasta like De Cecco or, if available, fresh pasta. For this dish, I prefer a medium weight pasta like spaghetti, pappardelle, ziti, orecchiette or penne. Chopped fresh tomatoes can be used, but they are not as flavorful as roasted tomatoes which have an earthy sweetness. Roasted tomatoes can be prepared ahead and kept refrigerated in an airtight container for up to three days or frozen for up to three months. During the winter at the Santa Monica Farmers Market, there are still farmers who bring tomatoes to market. Sold at a deep discount because they are misshapen and cracked. 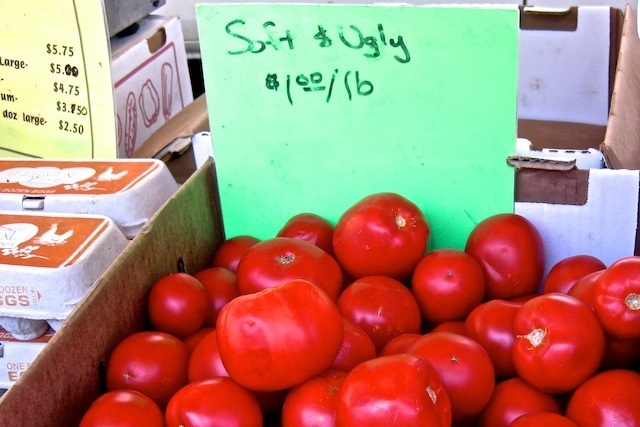 These "ugly" tomatoes are beautiful inside. 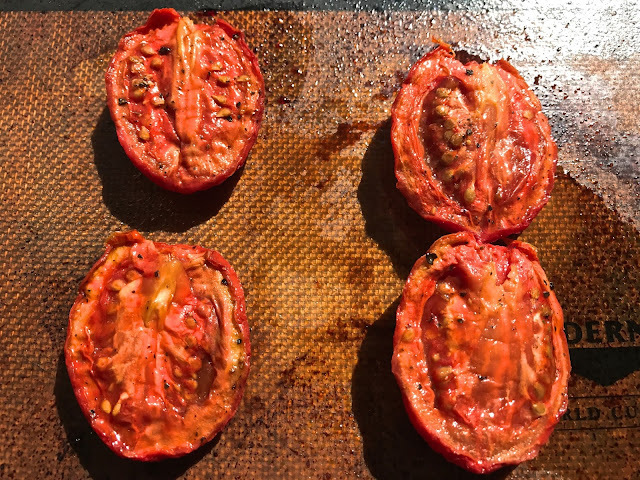 With a little care and the discolored parts cut away, a roasted winter tomato has a delightful, deep-flavored sweetness. To add crunch and visual contrast, add a lightly cooked green vegetable. Depending on what is available I use green beans, asparagus or broccoli greens. Cut tomato into 3 large, round slices. Line baking sheet with Silpat or nonstick sheet. Place tomato slices on sheet and place in oven. Cook 10 minutes. Remove from oven. Place large pot on stove filled with water to within 4" of the rim. Add kosher salt. Bring to boil. Cut asparagus stems into 1/4" rounds. Leave the last 2" of stem attached to the spear. Set aside. Heat 1 tablespoon olive oil in large frying pan on medium flame. When the salted water boils add pasta. Stir well and stir every 3 minutes for even cooking. Do not cover. Place a colander in the sink next to a heat-proof measuring cup. Sauté onions until translucent in the heated oil. Add mushrooms and asparagus. Stir well and sauté 3-4 minutes. Push vegetables to one side of the frying pan to clear space for the anchovy filets. Add another tablespoon olive oil. Allow 1 minute to heat. Using a sturdy fork, gently stir the anchovies into the heated oil until they dissolve. Toss the vegetables in the sauce. Tear apart the tomato slices. Add the bits and pieces and all of the accumulated oils from the baking sheet into the sauté pan. Add sweet butter (optional) and a pinch of cayenne powder (optional). Stir to melt butter. Toss well to integrate the sauce and coat the vegetables. Taste pasta after 10 minutes to confirm it is al dente. When you strain the pasta in the colander, capture 1 cup of pasta water in a heat-proof cup. To prevent sticking, toss pasta. Just before serving, transfer pasta into frying pan. Separate any that are sticking together. Toss to coat with sauce. If a little more sauce is needed, add 2 tablespoons pasta water and toss. Add more pasta water if more sauce is desired and stir. Transfer pasta into serving bowl. Top with finely chopped Italian parsley and serve with freshly grated cheese on the side. When You Don't Have Time to Cook But You Still Want a Home-Cooked Meal, Do This! Home cooked meals are definitely better for you and less expensive, but sometimes cooking seems too difficult and time-consuming. When you're tired and hungry, it seems easier to stop for take-out on the drive home, order in or nuke those Trader Joe's frozen Shrimp Soft Tacos you bought last week. But with a little effort (not much) and even less time (minutes), you can prepare two easy-to-make vegetable dishes that combine well with a charred steak, sautéed tofu or roasted chicken breasts which cook in no time at all. Salt boiling cooks vegetables quickly. Cook them as little as possible so they have a crisp, fresh taste. Like pasta, vegetables should be eaten al dente, with a little firmness. How long a vegetable should be cooked depends on its density and the size of the pieces being boiled. A 1" zucchini round will cook faster than a 1" carrot round. A 2" carrot round takes longer to cook than does a 1" carrot round. Adding kosher salt to the water gives the vegetables a sweet-salty flavor. 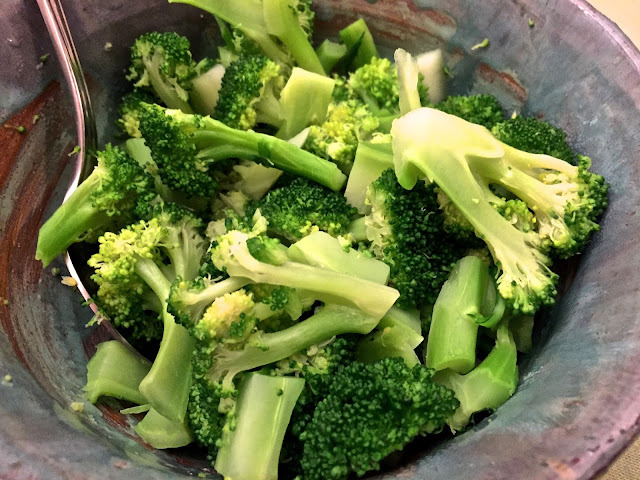 Broccoli florets prepared this way cook in 2 minutes. The bright green flavor bites are so delicious, we eat them hot or cold, as a snack, side dish or, cooled, added to a salad. Another easy-to-master technique is oven roasting vegetables. 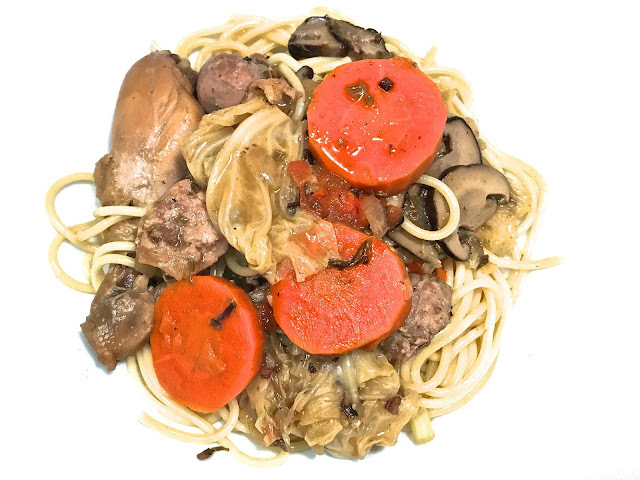 As with salt-boiled vegetables, they should be cooked al dente. How long the vegetables take to cook depends on the density of the vegetable and the size of the pieces. 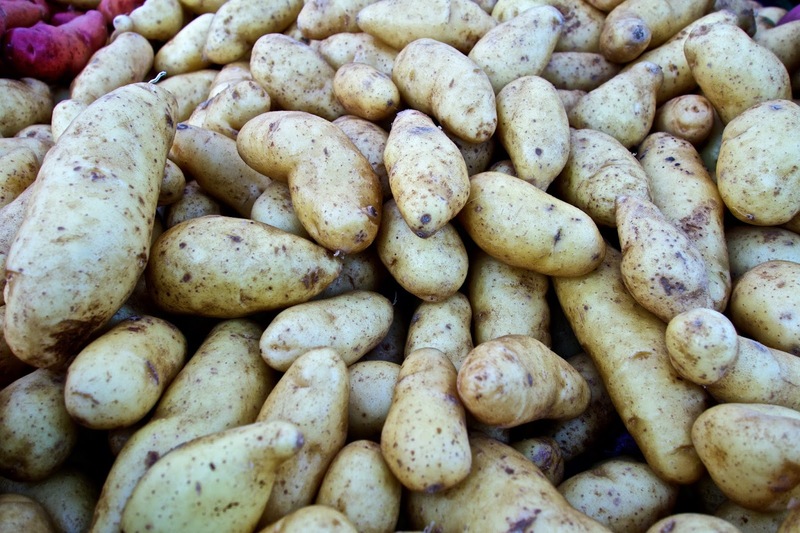 Fingerling potatoes are an especially good side dish to serve with a grilled or baked protein. They are delicious with a steak grilled on an outdoor grill or charred on a carbon steel pan. Before baking, toss the cut fingerlings with Italian parsley, olive oil, sea salt and freshly ground black pepper. If you enjoy onions, sprinkling a handful of finely sliced onions or shallots over the vegetables before baking adds a delicious sweetness. Buy broccoli that is deep green in appearance. 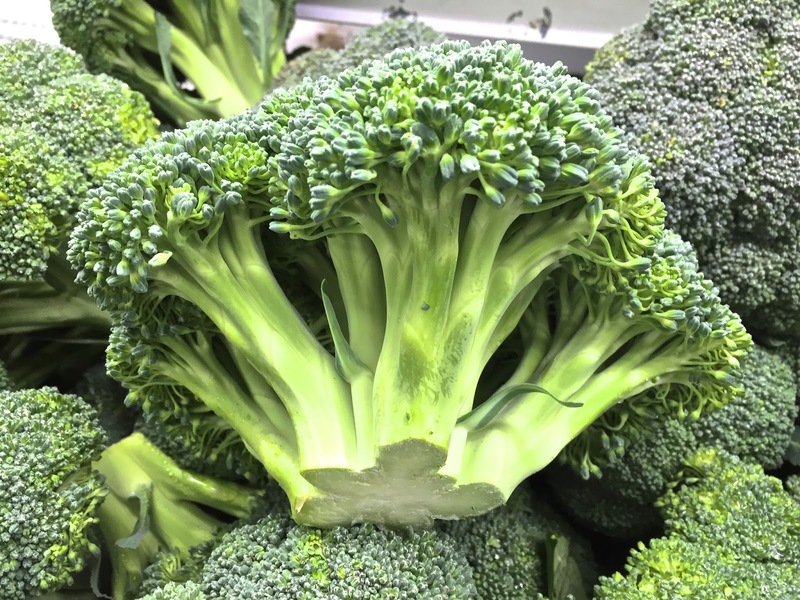 Do not use broccoli with yellow florets or ones that feel limp because that means they are old and will not taste good. Besides broccoli, the technique works great for spinach, carrots, English peas and green beans. Each requires a different length of cooking time. Spinach (30 seconds), peeled carrot rounds cut 1/2" thick (3-5 minutes), shelled English peas (30 seconds) and green beans cut into 1" lengths (3 minutes). Use only kosher salt or sea salt. Do not use iodized salt because of the metallic after-taste. Using a pairing knife, cut the florets (the bud or flower of the broccoli) off the stem. Cut each floret in half and set aside. Using a chefs knife, cut the stem into slabs, 1/2" thick, 1" long. Set aside. Add kosher salt to 4 quarts water and bring to a boil. Place stems in boiling water first. Cover. Cook 1 minute. Add floret halves to water. Cover. Cook exactly 2 minutes. 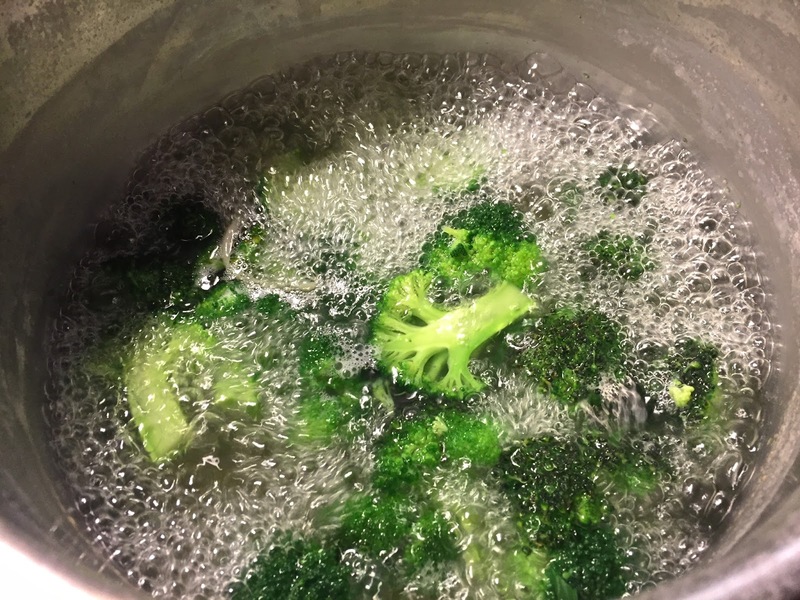 Strain broccoli in the sink. Place cooked broccoli into bowl and serve. If fingerling potatoes are not available, baby Yukon or Sierra Gold potatoes are also good. 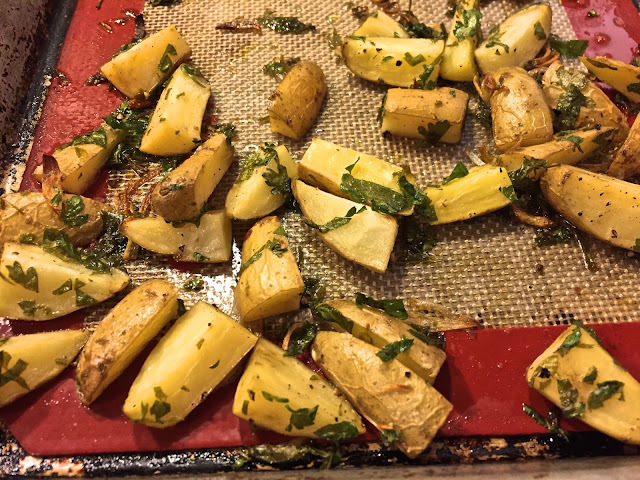 Use a Silpat sheet so the potatoes do not stick to the baking sheet. 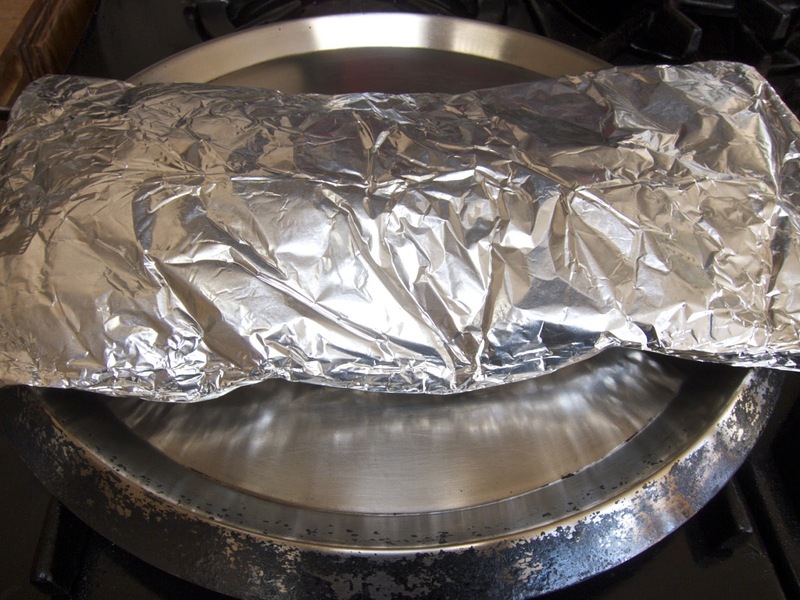 If not available, use parchment paper or aluminum foil. Line a large baking sheet with a Silpat sheet. Cut each potato in half, the long way, then into 2" pieces. Place them in a mixing bowl with the olive oil. As the cut potatoes are added to the bowl, toss to coat with olive oil to prevent discoloration. When all the potatoes are in the bowl, add parley and onions. Toss well. Season with a little sea salt and freshly ground black pepper. Spread on the Silpat sheet lined baking sheet so the pieces have some room. They will acquire more browning if they are not piled on top of one another. After 15 minutes, toss for even cooking. Check after another 15 minutes. Toss. Taste. Adjust seasoning and cook longer if needed. When the potatoes are cooked through but not too soft, serve hot with a protein. The potatoes are delicious with a grilled steak, sautéed fish filet or charred chicken breast. 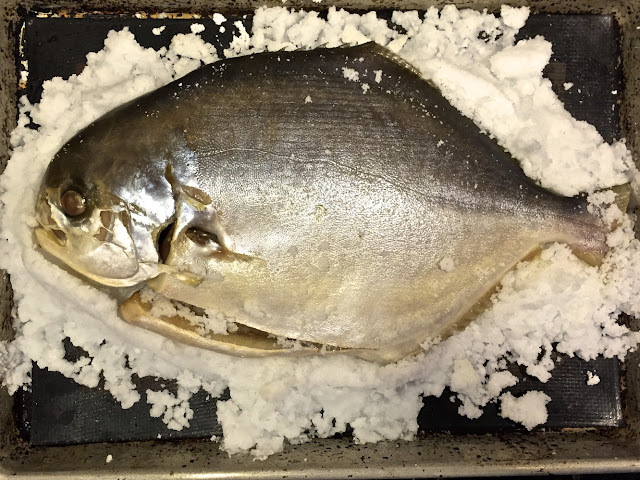 Hard to believe but the easiest way to cook a fish is to roast it in a dome of kosher salt. The prep time is under 10 minutes. 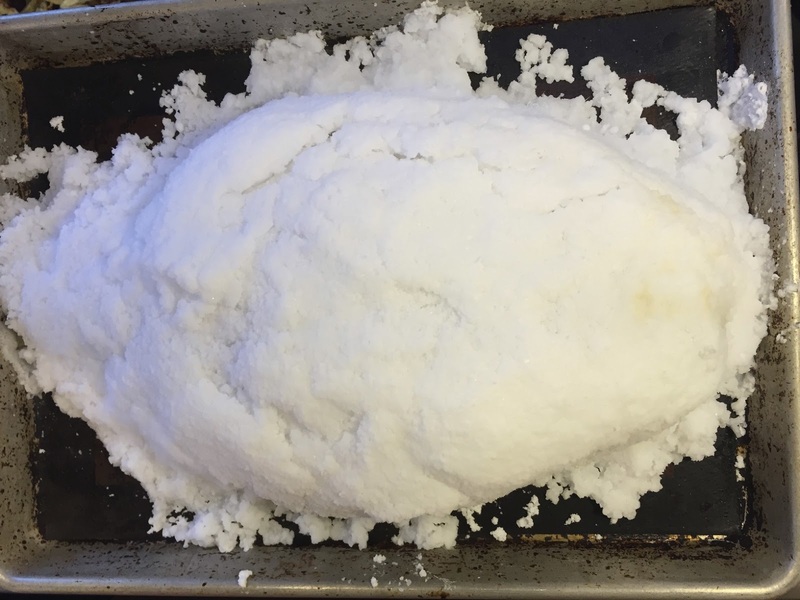 The salt covered fish roasts in the oven 10 minutes a pound. Let the fish rest for 5 minutes. Crack open the salt dome. Peel back the skin. Cut off the head and tail. Pull off the bones. And serve the oh-so tender, moist filet with a salad or oven roasted vegetables or maybe pasta tossed with butter and Parmesan cheese. So delicious. So easy to make. 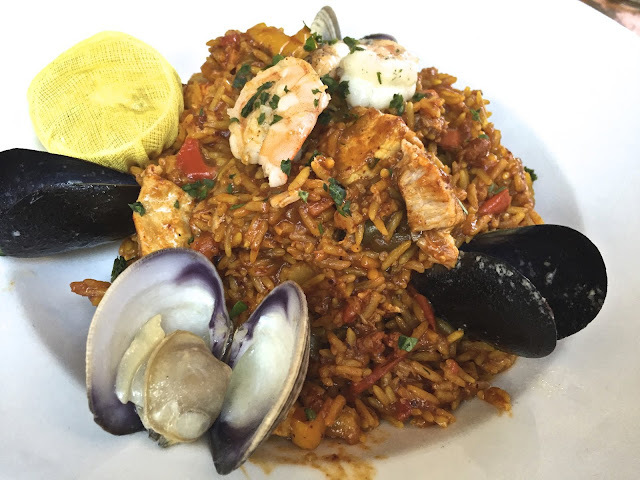 Please check out the article and recipe on Zester Daily. And email me photographs of YOUR FISH when you make it. I love clams just about anyway they can be eaten--raw, baked or steamed. For a New Year's Eve dinner, a group of us pooled our labor and resources to prepare a Spanish themed celebration. For the paella we made a seafood and sausage version. In our enthusiasm for the excellent clams being sold at Santa Monica Seafood (1000 Wilshire Boulevard, Santa Monica, CA 90401, 310/393-5244), we bought a large mesh bag of little necks. They proved to be fresh, briny and delicious. But we purchased too many. Reserving half, we decided to enjoy the rest on another day. 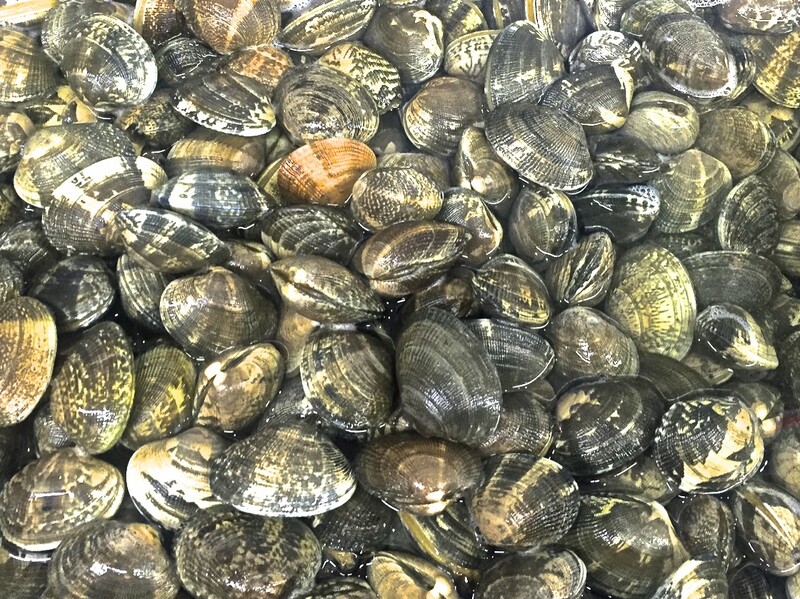 The great thing about live clams is that you can keep them in your refrigerator for several days after purchase if they were freshly harvested. Place the clams in a bowl without water. The clams will "drown" in the liquid they give off, so check each day and pour off any liquid that has accumulated. Before using the clams, rinse them under running water and brush off any grit. A flexible recipe, if green beans aren't available, another green vegetable can be substituted. I have used kale, spinach and even escarole (which I am using a lot these days in salads and sautés). Sometimes I add corn kernels either fresh or the ones I freeze at the end of summer. I like freshly grated cheese even though I know that's heresy to anyone who loves authentic Italian cuisine. When I wrote the recipe for Zester Daily, the weather had turned cold and wet. Now we're back in a Southern California heat wave. In either case, the dish is a perfect cold weather warm-comfort dish or a light meal with a salad in warm weather. Maybe you are rushed because your work day is long or you are preparing a big meal for a party of relatives who are coming the next day. Taking care of yourself is important. A well-made, hot meal on a cold, wet and windy night is essential. One of the easiest meals to prepare is pasta which cooks al dente in about ten minutes. In that short amount of time you can make one dish that will be a full meal if you include not just sauce but lots of good vegetables and proteins. So no excuses about being too rushed or too tired. Tonight I used what I had in the refrigerator. Luckily I had some very good ingredients. I used green beans I bought at an Asian market in Little Saigon 30 minutes south of Los Angeles International Airport. I don't know why but the green beans I buy anywhere other than an Asian market are not good. Even at farmers markets. At any rate, I had green beans because I like to make a salt-boiled green bean salad with shallot slices charred in a carbon steel pan. That was for tomorrow night. Tonight, I used a handful of the green beans, but if I had kale, spinach, broccoli or broccolini, I would have used those. The point is to use a "green" vegetable because it helps balance the richness of the chorizo and butter (which is optional but adds a wonderful silky sweetness). The chorizo was a doggie bag treat that I brought home from a lovely lunch at chef Jason McLeod's Ironside Fish & Oyster restaurant in San Diego's Little Italy (1654 India Street, San Diego). Several years ago I met chef McLeod when he was in charge of the kitchens at the Toronto Four Seasons when I was producing an ABC pilot. He was kind enough to let me take over a station in his kitchen so I could cook for our lead actors and my fellow producers. The experience was fun and good relief from an arduous shoot. I learned an important lesson on that show. When you get really cold, like when you have been scouting a roof-top location at night in Toronto during the winter and the wind blows across a very frozen Lake Ontario, you will find it very difficult to get warm. Not a hot bath. Not several layers of clothing could get me to stop shivering. I think I finally got warm by standing next to a fireplace and drinking a tall whiskey. Chef McLeod and I kept in touch for several years as he moved from Toronto to Whistler and then we didn't connect again until I happened to notice he had opened Ironside Fish & Oyster in San Diego. When I saw him last week, we caught up and then my wife and I had lunch while chef went back to running a very busy kitchen. He treated us to an amazing appetizer of sea urchin, which I love and which he is able to source locally in the waters off San Diego. We had fish and chips, which came with very good cole slaw and seafood paella, which normally includes a generous helping of sautéed crumbled chorizo. Since my wife is pescaterian, the chorizo came home with us. Hence it's availability for the pasta. 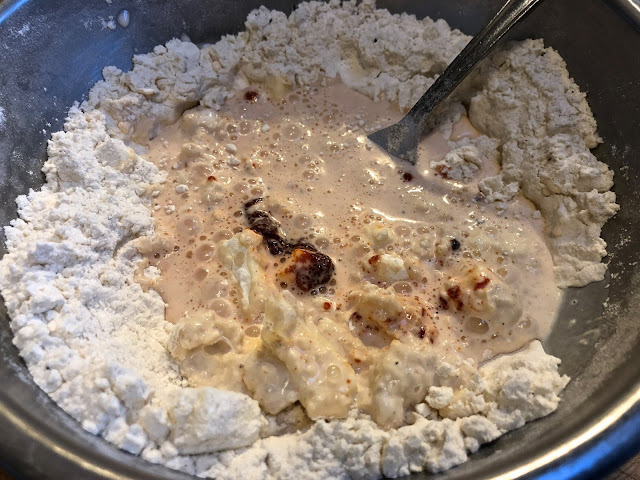 If you don't have crumbled chorizo, use crumbled crisp bacon or any kind of Italian sausage you enjoy, but do remove the sausage from the casing so you can create a crumble when it cooks so it combines better with the sauce. The butter is certainly optional as are the anchovies. But I would recommend both. The anchovies disappear in the sauce and reveal themselves combined with all the other flavors. Choose whatever pasta you enjoy, but preferably a bite sized pasta like ziti, penne or bowties because they coat well. Use homemade stock because canned and frozen stocks have a high sodium content. When you roast a chicken, boil the bones, strain and reserve the stock to freeze in pint and half pint sizes. When you make shrimp or lobster, boil the shells, strain and reserve the stock to keep in the freezer. That way you will have a ready supply of healthy broth to use for sauces, stews and soups. If you have uncooked chorizo and sausage, remove the casing. Heat a sauté pan with a drizzle of olive oil. Crumble the chorizo or sausage with your hands as you add it to the hot pan. Further crumble the meat with a fork as the sausage cooks. Remove when the sausage is lightly browned. If using bacon, cook 6 pieces of bacon in a large frying pan, turning frequently until browned on both sides. Remove, drain and when cooled crumble. Boil a large pot of water with kosher salt. Add the pasta and stir well. Cook approximately 10 minutes or until al dente. While the pasta cooks, heat a large sauté or carbon steel pan on a medium flame. 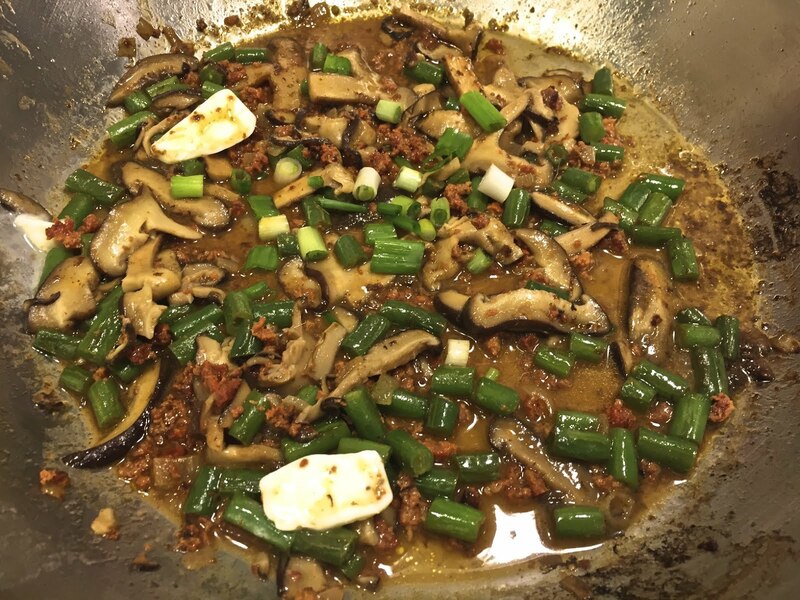 Add the olive oil and sauté the green beans, mushrooms and shallots until the beans are tender. Add the anchovies. Use a fork to mash the anchovies against the bottom of the pan to break them apart. Add stock and stir well to dissolve the anchovies. Cook and reduce the liquid by half. Add the cooked chorizo or sausage. If using cooked bacon, do not add until just before serving to preserve the crispness. Check the pasta. If it is al dente, get ready to strain out the water. Put a heat proof container in the sink. As you pour the pasta through a strainer, capture 1/2 cup of pasta water in the heat proof container and reserve. Set pasta aside while you finish the sauce. If the sauce is too thin, raise the heat and reduce the liquid. If there isn't enough sauce, add some of the pasta water and stir well. If using sweet butter, add and stir to dissolve. Separate the individual pieces of pasta if they stick together and add to the pan. Stir to coat with the sauce. Taste and adjust the flavor with sea salt, black pepper and cayenne (optional). Add more pasta water if you want more sauce. Serve hot with freshly grated Parmesan or Romano cheese. Often the most ingenious cooking techniques are the simplest. Years ago I met a Thai chef who graciously showed me some basic cooking techniques. One particular technique I loved was cooking raw shrimp in an aluminum foil pouch. The resulting shrimp were plump, juicy and sweet. Of course the freshest, highest quality shrimp needed to be used. I loved the technique not only because of the result but also because as the shrimp cooked, the pouch expanded. That reminded me of the way stove-top Jiffy popcorn puffed up. Long before there was microwavable popcorn, Jiffy satisfied the hunger for easy-to-make snack food. Prepared correctly, the popcorn came out nicely steamed. But if you weren't careful, the bottom kernels burned and gave the whole bag of popcorn a harsh charcoal flavor. 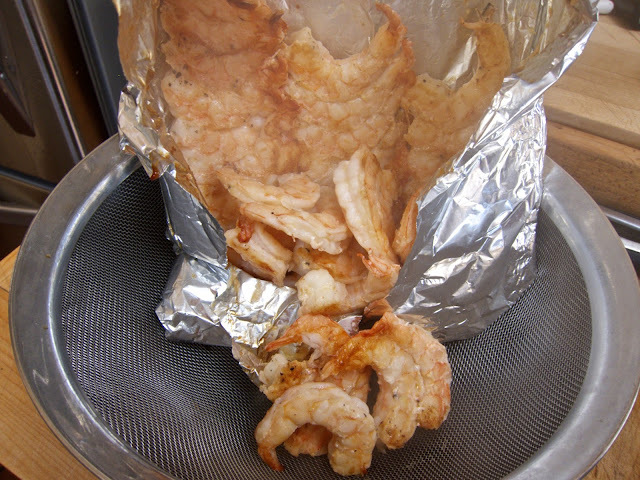 The same is true of cooking the shrimp in an aluminum pouch, be careful not to burn the shrimp. Preparing the shrimp this way can produce perfectly steamed shrimp to use for an icy-cold shrimp cocktail to accompany an equally icy-cold vodka martini (dirty, of course, with an olive and an onion) or to be served hot and steaming on a platter. With the shrimp cocktail, serve a horseradish-hot cocktail sauce. With the hot shrimp, remoulade is a good accompanying sauce or chermoula. After steaming, the shrimp can be quickly charred on a carbon steel pan to add a bit of color and sweetness. That's what I did tonight for dinner when I made the shrimp with charred shallots and remoulade. Raw shrimp that have been shelled and devined can be used, but I prefer to go the distance and do the prep work myself. That way I know when the shelling and deveining was done and I will harvest the shells to make a light and delicious shrimp-shell sauce. More about that in another post. Use any size shrimp you like. Smaller shrimp will cook more quickly and are more trouble to shell and devein. In general, I would recommend medium to large sized shrimp. Time to prepare depends if you are shelling and deveining them yourself. The cooking time will also vary, depending on the size of the shrimp. Choosing a mustard to use to make the remoulade is a personal choice. Dijon has a good clean flavor but can be intense. A milder choice is deli-style mustards. In either case, buy a good quality mustard. To make the remoulade, mix together the mayonnaise, mustard and capers, seasoned with black pepper. Place in an air tight container and refrigerator. If the raw shrimp are shelled and deveined, wash and pat dry. If not, peel the shells off, starting with the legs and rolling them off the flesh, pulling off the tail at the same time. Using a sharp paring knife, cut a shallow incision in the back of the shrimp, remove the black vein and discard. After shelling and deveining, rinse the shrimp again in clean water, drain and pat dry. Lay the sheet of aluminum on a flat surface. In the middle of the sheet, lay the shrimp snuggly together, all facing the same way. Imagine they are coodling in bed. 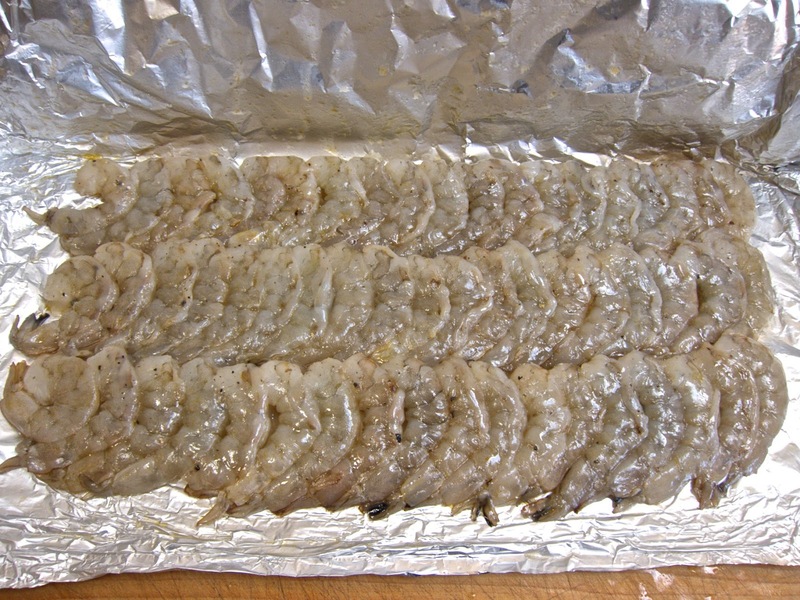 Fold the foil over the shrimp and neatly seal the ends being careful to keep the shrimp flat. The objective is to create an air-tight pouch. The ends of the pouch should be folded over 3-4 times so that as the pouch expands, the ends do not pop open releasing the heat and liquid. Heat a pan large enough that the pouch can fit in the center. Turn the heat onto high. Have a pair of long tongs at the ready. To determine that the pan is hot enough, dip three fingers into a bowl of water and fling drops of water into the pan. If the water skitters across, the pan is hot enough. Have a large plate ready. Place the pouch onto the hot pan. When the pouch inflates, the shrimp are cooked on that side. If the pouch is not sealed completely, the pouch may not inflate. The shrimp will cook regardless. In which case, assume that 3 minutes on each side will cook the shrimp. Carefully use the tongs to turn the pouch over. Lay the pouch in the middle of the hot pan. If the pouch had inflated, turning it over will deflate it. When it inflates again or the pouch has been on the hot pan for 3-4 minutes, the shrimp should be cooked. Using the tongs, hold the pouch over a bowl and cut open the pouch. Remove the shrimp, reserve the liquid to make a sauce for another dish and, if you are not immediately serving the shrimp, refrigerate in a sealed container for up to 24 hours. Just before serving, finely slice the shallots the long way (end to end). Toss with olive oil. Heat a frying pan. I like using a carbon steel pan which will quickly add a beautifully flavorful caramelization on the shallot strands. Place the oiled shallots into the pan. Using tongs, toss well and sauté until the shallots are charred. Remove from the pan and set aside. Heat the pan again. When it is hot, place the shrimp in the pan for a few seconds on each side, just long enough to lightly char the sides. Remove. Serve the shrimp topped with the charred shallots accompanied with a small bowl of remoulade. 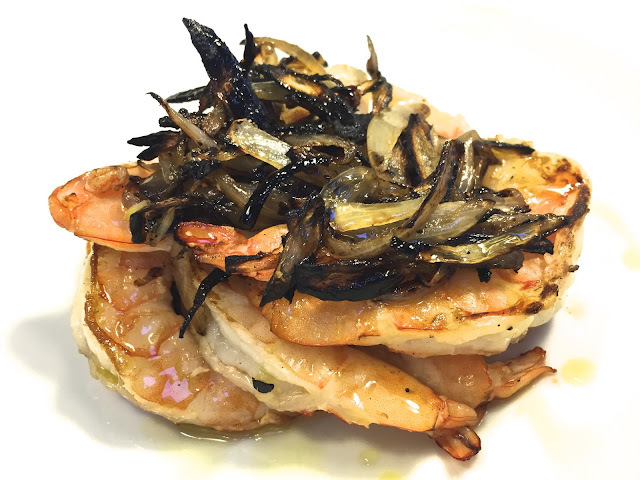 The shrimp can be accompanied with steamed rice, freshly made pasta or a tossed green salad. And don't forget the dirty martini! Over the weekend, the rain beat down steadily all day. At first more like a mist at a car wash, then in steady sheets that drenched any one deciding the time was perfect to visit a favorite restaurant. Which is exactly what we did. We met our sons at Yabu in West Los Angeles (11820 W. Pico Blvd, Los Angeles, CA 90064, 310-473-9757) for a 2015 New Year's dinner. With the weather outside cold and wet, we were happy to be inside the busy, warm restaurant. We ordered our favorite dishes: udon with mushrooms, tempura vegetables and shrimp on seasoned rice, salmon sashimi with pale white daikon threads & wispy pickled seaweed, spinach salad seasoned with mirin and sesame paste, sea urchin (uni) sushi with quail yolk, egg omelet sushi (tamago), baked crab hand roll and hot soba in soup with thinly sliced scallions and paper thin sheets of fatty duck breast. We talked, shared a bottle of hot sake and looked at photographs from our holiday trips. A great way to begin the new year. Yesterday the rain was reduced to a light drizzle. Not enough to soak through a thick sweater but enough to chill skin and bone. When it was time to think about dinner, I had only one thought. Cook something easy. Cook something in one pot. And make sure it is hot, filling and delicious. A few years ago a press trip took me Spokane, Washington and Moscow, Idaho. The area is well-known for its agricultural products, most importantly lentils. A representative of the USA Dry Pea & Lentil Council gave us a "Lentils 101" talk that described the many varieties of lentils, their nutritional value and economic importance to protein-starved regions of the world. Each of us was given a copy of The Pea & Lentil Cookbook: From Everyday to Gourmet which has recipes using dried legumes in dishes as varied as appetizers, soups, salads, entrees and desserts. Cooking with lentils is easy. The basics are wash and rinse the lentils. Discard any broken or misshapen lentils. Generally speaking lentils are cooked in water at a ratio of one cup of lentils to two and a half cups of water. Simmer covered for 30-50 minutes, tasting the lentils as they cook and removing the pot from the stove when they are to your taste. Cooked longer, lentils will soften and can be used in purees for soups, dips, sauces and spreads. I like the lentils to retain their shape so I cook them only until they are al dente. Lentils come in many varieties. They are not all the same. Find the ones you like. My favorites are Beluga or black lentils and Spanish pardina lentils, which I used last night. Roasted tomato sauce adds a pleasing acid. Canned tomato sauce may be used, but a better alternative is to make your own. For Zester Daily I wrote about making roasted tomatoes and sauce to keep in your freezer. Rinse the lentils, discarding any that are broken or discovered. In a 2 quart sauce pan, heat the olive oil. Add the dry spices and garlic. Lightly brown. Add the onions, mushrooms and carrots. Saute until lightly browned. Add the lentils, water and roasted tomato sauce. Stir well. Bring to a simmer. Cover. After 15 minutes, add the spinach leaves. Stir well. Cover. 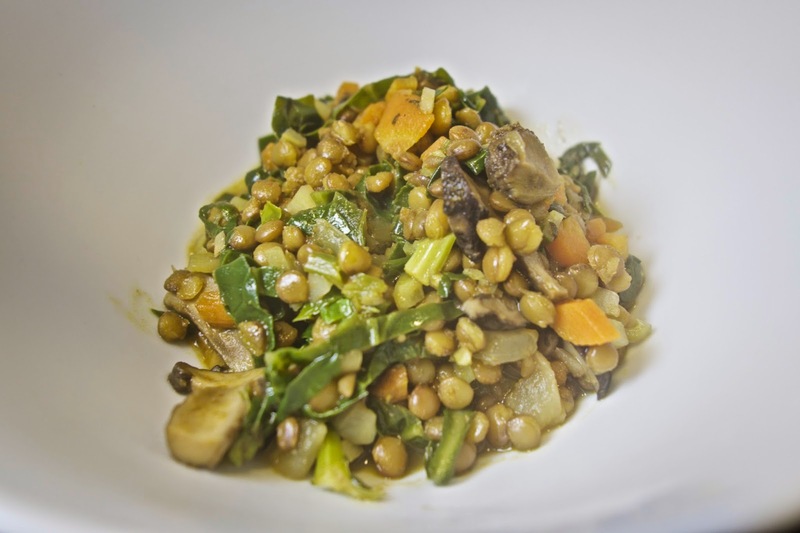 The lentils may take 25-45 minutes to soften. How long depends on many factors. After 25 minutes, taste a few lentils. If they need more cooking and the liquid has evaporated, add enough water to keep the lentils covered. Stir well, cover and continue cooking, checking the pot every 5 minutes until they have achieved the desired texture. For Zester Daily, I wrote about two ingredients I love: anchovies and chicken livers. Not every one likes both (or either, for that matter). As with so many foods in our lives, dishes served when we are young put strong imprints on our adult palates. Most nights when my father came home from work, he would settle into his leather recliner and watch wrestling on TV. While my sister and I set the table, my mother would serve him an appetizer plate and his cocktail of choice, a 7&7 (Seagrams & 7-Up). His favorite appetizers reflected his Russian Jewish background. There would be plates of pickled herring with sour cream, chopped chicken liver, pickled beets and onions, anchovy fillets and pumpernickel bread that he ordered from a mail-order outlet in New York. Wanting a father-son moment with my father, who was decidedly old school and not much into father-son moments, I would sit next to him and share the appetizers (and steal a sip of his 7&7 when he wasn't looking). I definitely developed a taste for the anchovies and chicken livers but not for the pickled herring with sour cream! One day, with very little in the refrigerator, I wanted a lunch with a lot of flavor that wouldn't take much effort to create. With a box of pasta, a couple of chicken livers, a tin of anchovies, an assortment of aromatics and a few other ingredients, I put two and two together and made a dish that was light and delicious. I wonder if my dad would have liked it? In many Italian, Spanish and French dishes, anchovy filets supply a deeply nuanced umami that turns the ordinary into the passionately delicious. Italian puttanesca, Tuscan chicken liver paté and French tapenade are but a few examples that come to mind. Without anchovies they are good. With anchovies they are delicious. Combine skinless anchovy filets with caramelized chicken livers, toss with pasta and dust with freshly grated Parmesan cheese and surf dances with turf in the most beautiful way. Pasta is wonderful and infinitely variable. Pasta can be complex or simple. For many cooks, the best pasta dish is one that allows the ingredients to shine through with a minimum of sauce. Toss penne with fresh English peas, a bit of oil and garlic, a dusting of cayenne and a fresh grating of Romano and all that is necessary to complete the meal is a crisp Fumè Blanc, a farm-fresh green salad and a dessert of fresh fruit with a nice selection of cheeses. Chicken livers and anchovies are as different as can be. When cooked properly with a charred exterior and an interior still moist and pink, chicken livers are creamy and earthy with a hint of sweetness. Anchovies on the other hand have a sharper impact on the palate — salty, raspy and tangy. Combined, they bring out the best in one another. As with any simple recipe, this dish is only as good as the quality of the ingredients. Whenever possible, buy organic chicken livers to avoid the chemicals and antibiotics that can accumulate in birds that are raised in industrial coops. Skinless anchovies packed in olive oil are not overly salty. Because the fish are caught all over the world, experimenting with different brands will lead you to the one you like the best. Spanish and Italian anchovies are especially good, whether packed in glass jars or in tins. The price can vary from an affordable $2 a tin to well over $15 for a glass jar of the same weight. Before using chicken livers, wash and pat dry. Using a sharp paring knife, cut away any fat, sinews or veins and discard. Separate the two lobes. Cut each lobe in half, making bite-sized pieces to facilitate even cooking of the livers. 1. In a 2-gallon pot, fill with water to within 3 inches of the top. Add kosher salt and bring to a boil. Put in pasta and stir well. Allow to boil 10 minutes, stirring every 3 to 4 minutes. 2. Taste and when al dente, place a small heat-proof cup in the sink next to a colander and drain the pasta, capturing 1 cup of pasta water in the process. Return the pasta to the warm pot and set aside. 3. In a large frying pan, heat the olive oil. Sauté onions, garlic and Italian parsley until lightly browned. Using a fork, add the anchovies, dragging them along the bottom so they break apart. Stir well with the aromatics. 4. Add the chicken livers to the pan, using a large spoon to move them around the pan so they lightly brown all over. Be careful not to overcook and dry out the livers. 5. At this point you have some options. You can season with cayenne for heat, add chopped olives for another layer of flavor, stir in quartered cherry tomatoes to contribute liquid and a bit of acid to the sauce and sweet butter for creaminess. 6. Or keep it simple and do one, some or none of the above. In any case, add ¼ cup of pasta water to the frying pan and stir well. 7. Just before serving, add cooked pasta to the frying pan over a medium flame and toss well until heated. Top with freshly grated Parmesan or Romano cheese and serve. 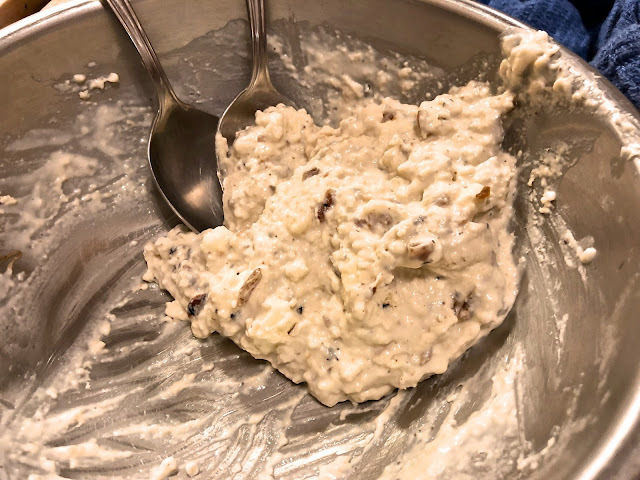 For Zesterdaily last January, I wrote about beginning the new year with an easy-to-make, good tasting dish that is healthy and all about flavor. After making the omelets through out last year, I think it's a great way to begin 2014. A new year with new resolves for personal improvement is the best of times and the worst of times. At the top of many people’s resolutions is eating sensibly with an asterisk to give up everything that tastes good. To eat well doesn’t mean denying yourself pleasures. In fact, consider the gastronomic advantages of a one-egg omelet. A neighborhood restaurant we frequented for many years proudly publicized their three-egg omelet. The omelet was a plump 2-inches thick and settled on the plate like a seal sunning itself on a wave-washed rock. After eating their three-egg omelet, I always felt like going back to bed. Having consumed many omelets over many years, the realization hit me that what I like about an omelet isn’t the eggs. What I like is the filling. At home I experimented. What I was looking for was a ratio of bulk: flavor that pleased my palate and wasn’t overly filling. Three eggs were never considered, and eventually two eggs gave way to one. Another significant milestone was switching from a stainless steel pan to the more forgiving qualities of a nonstick pan. One egg creates texture not bulk and places the emphasis solidly on the filling. Just about anything sautéed, roasted or grilled can find itself tucked into the confines of an eggy bed. Whatever the mix of ingredients, the key to a good omelet is creating a warm creaminess of melted cheese. The combinations are limited only by your palate preferences. The salty-sweetness of sautéed ham, Comte cheese, spinach, shallots and shiitake mushrooms complement the pliancy of the egg. Grilledasparagus and Parmesan cheese, dusted with finely chopped Italian parsley leaves makes an elegant omelet perfect for breakfast, lunch or dinner. Shredded lobster, Manchego cheese, cilantro, raw red onions, a dusting of cayenne and a small amount of finely chopped ripe tomatoes transform an ordinary egg into a culinary adventure. Adding country-fried potatoes, buttered toast with jam and crisp bacon, a tossed green salad or a bowl of fresh fruit to fill out the plate and the one-egg omelet creates an enviable meal, heavy on flavor and careful about calories. Use any cheese of your liking. I prefer a cheese that plays well with others. Strong cheeses, such as blue cheese, will dominate the other flavors in the filling. Mild cheddar, Comte, Manchego and soft goat cheese work well. The recipe is for one, because making each omelet individually will result in the best looking dish. 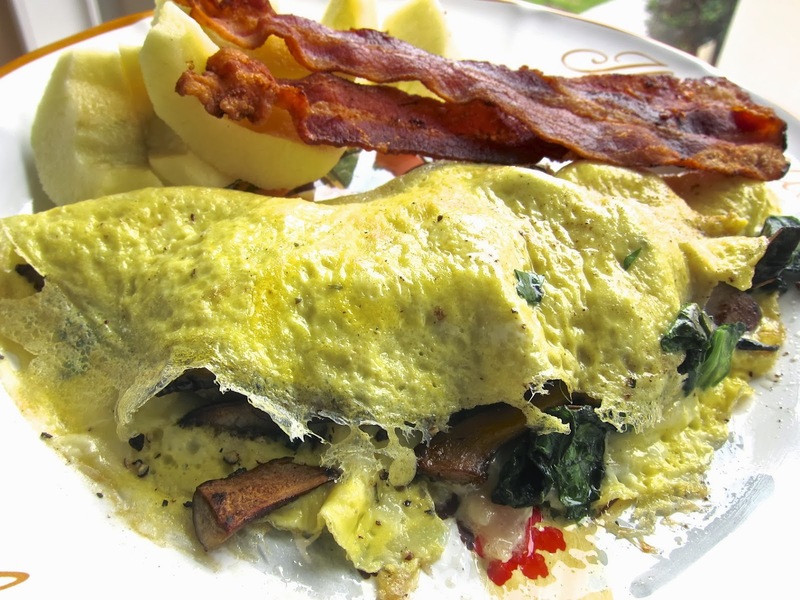 If you are serving more than one, multiply the number of diners times the ingredient quantities for the filling to create the correct amount needed to make all the omelets. Use a 9-inch nonstick pan, understanding that nonstick pans are designed to be used on low heat. Because an excessive amount of fat is not required to prevent the egg from sticking to the pan, the butter is used for flavoring. Could the omelet cook on a nonstick pan without the butter? Yes, perhaps as serviceably, but that little bit of butter adds a lot of flavor. 1. In the nonstick pan, melt 1 teaspoon butter and sauté together the spinach, shallot and shiitake mushrooms until wilted and lightly browned. Season to taste with sea salt, freshly ground pepper and cayenne (optional). Use a high-heat or Silpat spatula to remove the sauté from the pan and set aside. 2. Beat together the 1 egg and milk until frothy. 3. On a medium-low flame, heat the nonstick pan, melt the remaining teaspoon butter and pour in the egg-milk mixture using the spatula to get every drop into the pan. 4. Swirl the egg mixture around to coat the bottom of the pan so it looks like a full moon. 5. Gently sprinkle the cheese on one half of the omelet — the half moon with the filling –and spoon on the sauté to cover the cheese. 6. When the cheese has melted and the egg is cooked the way you like, use the Silpat spatula to gently flip the empty side of the half moon on top of the filling. 7. Use the Silpat spatula to help slide the omelet onto the plate and serve hot.